What should I post about? That's a really good question. When you decided to start your blog, did you think about it then or were you just hoping it would come to you later on once you got started? If you're like me, it was a little of both. I had an idea, but I wasn't really sure. The other day, someone mentioned to me about having writer's block or maybe "blogger's block" would be a better way to describe it. They'd hit a wall on what to post. I don't know if I have the answer for you, but I can tell you what I do. It basically comes down to posting what you love about the hobby. I'll use myself as an example. When I first started blogging, I did the rumor thing. Posting about all the latest stuff I found on the internet. It was fun, but lots of people were and still are doing it better than me. Then I started the FTW Blogger Group. But that alone did not set me apart from everyone else. It's still the best thing I think I could have ever done as far as contributions to the 40k world go, but that's another post. Then I really started looking at what it is that I do with the hobby. 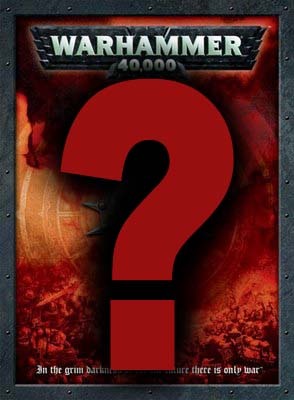 What did I want to share with the rest of the 40k world? It wasn't battle reports, tacticas, army lists or tournament advice. I don't have those. To post that stuff wouldn't draw the response I get when I post things that are important to me. I love basic modeling/painting and gaming. And so I started focusing on those two things. Sure, other bloggers post about these things as well, but these are what I focus on, these are what are important to me. They are what I have the most experience with and when I blog about them, I like to think it shows. If I go through Google Analytics and look at what posts have gotten the most actual views (excluding the FTW Blogger Group stuff and things like Tutorials and Downloads pages), the top posts are my finished commission pieces where I showcase the finished model. When I go through and look at what posts have picked up the most reader comments, they are the editorial articles where I talk about gaming or things that have directly impacted my gaming. So what should you post about? Maybe the question should be, "What is important to you?" Once you know what that is, you'll never run out of stuff to post. If it's battle reports, then go with it. Make them the best ones out there. If it's rumors, then get your ear to the ground and figure out what's going on. If you love writing tactical articles, then do your research and show us how to win games. I will add this... if you started blogging to escape forums and bulletin boards because you want the freedom to "express yourself without certain restraints," you may be disappointed when not everyone jumps aboard with your blog. There are lots of critics out there and every one of them has an opinion. My point is this, find what you love about the hobby and post about that. You don't have to post everyday, you don't have to be the best, you don't have to know all the tricks and paint like a pro, you don't have to greenstuff things from scratch. If you're posting about what you love, it'll show and you'll never run dry of things to say. And your readers will respond. Excellent article and great advice indeed. I tried to start my blog with a particular focus but soon found that I ran out of things to say. My hobby interests are wide and varied so no I write about everything from painting to news items to museums I've visited. It's an eclectic mix but I rarely find myself lost for something to write about. My reader/follower numbers have increased steadily over the last year so my approach seems to be working. It’s not to everyone's taste, but the key is understanding that what you write about should be as much for your own enjoyment as anybody else’s. If it’s not fun, why bother? Brilliant advice there, Ron. I think at some point everyone that has started blogging about something in particular has hit that particular wall. There are several things I really enjoy about the hobby and I tend to spread my posting around those things. I'm working on an interesting way to share my battle reports which will be included once it works! Initially, I wanted to just to have all my posts regarding my hobby in one place. Now, I feel like I don't know what I want my blog to be about, but I do love posting on it! Great post, Ron - I started blogging as a means to keep myself motivated and involved in the hobby, and I set a couple ground rules for myself when I started: Every post would have at least one picture (they're worth a thousand words after all), and I'd only do 40k-related posts with a focus on my Imperial guard. Over the last year I've managed the first, and have stayed mostly on target with the second. The feedback from readers is always helpful, but I don't get too wound up about viewing stats or comments. If people have comments or criticisms I'm happy to get them, but if a post goes by with no comment I've still gotten what I wanted out of the blog by virtue of getting some project work done and posted. When it's all said and done, posting what is important to you is guaranteed to be rewarding! When I started I waited a month to check that I would have things to write about, and although my blog is currently almost exclusively Warhammer 40k related I purposely left it open for me to write about any and all gaming - Warhammer, RPGs, Boardgames and even computer gaming which was one way I could think of to give me some options if I got writer's blog. Excellent post Ron, and I totally agree. After my initial block many moons ago, I decided to do just the same. I post about my models, my scenery, my games, my hobby in general, and my inspiration .... my kids. The only thing that slows me down is the amount of time I have for blogging. Good stuff, it's something to take to heart. To answer your question. I started my blog because I felt I had something I wanted to say. I didn't know if anyone else was interested but I was hoping so. I wanted to show and document my painting and my hobby. I write when I have something to say or when I have had a hobby session. Nice post. I especially like the quote. Inspirational for all life really. I post because I am trying to work out my own questions about the game. I love figuring out tactics and how to do better. The funny part is that I love reading about the painting side...weird. That's one of my favorite qoutes ron, thanks for including it in your piece! I started my blog to break the ice on my lack of techno-savvy, to share my love of Warhammer, and because I am a bit of a shameless egotist. I started my blog to help people. I've played the game for 16 years and, while I'd not say I was a God of War(Hammer) I'd like to say I'm pretty good - and I want to improve my game by improving the games of others. If everyone plays as well as me or better, then I can only improve through playing them and, often as not, losing. Plus, it was handy for pictures of my conversions - such as the Rifleman I started my blog with a few pics of, and recently posted pics of a more recent version of the same. I try not to post what people want to read, but what I want people to read. Yes, that makes sense. Sounds a bit more arrogant than I intended...but whatever. Thanks for the article mate. I have had a bit of a slow patch for some time due to the old blog block. Great post Ron! The last paragraph is the key one that resonates for me: not having to post everyday, posting about things I want to and not being afraid of things not being the best in the world. Thanks for all the comments guys. I appreciate the feedback. Sometimes I wonder how posts like this will be met by the community but they just seem to worth posting and I'm always happy to hear that others get something from these editorial/rant type articles. This was exactly what I needed to read this morning Ron, thanks! Having just started my blog a few days ago, I was concerned about getting Blogger's Block early on, but this article has helped me realize the whole quality vs. quantity thing applies here as well. You don't have to post multiple articles every day continuously to keep interest. You just need to share what YOU enjoy and make a quality product because, chances are, if you enjoy it, there are surely plenty of other people that share your interest in your specific niche of the hobby as well! Never really though about that. I think i started my blog to keep me motivated and to see for myself how my army is evolving. Back then when i started i wrote in finnish and soon i lacked any interest updating, now that i restarted writing my blog i chose english so that it would hopefully be easier to understand. And even way before the first blog i was trying to do similar "blog" at few forums but reception and all random chit chat that was taking place at my thread was so massive that my "blog" got lost. Now im just writing things i do with my army and everything thats involving it. I have started to teach my 9 year old twin boys to play and they have been excited to show off our blog at school. Currently im redesigning our blog at the moment to give them their own space. JasoX: It all comes down to sharing the parts of the hobby that are important to you. Including your boys in the hobby is a huge bonus.